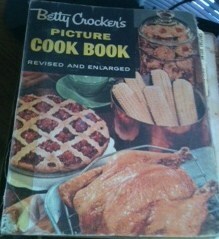 In 1956 Betty Crocker Cookbooks not only cared deeply about 1956 Mom’s cooking; they cared deeply about her life. As proof, here’s some hints from the “Special Helps” section. Apparently in 1956, it was perfectly acceptable for Mom to lie down on the kitchen floor to relax and/or fall asleep for as long as 3 to 5 minutes without anyone thinking she was completely out of her gourd. It’s not clear if this odd form of “relaxation” was reserved only for the kitchen floor or if one might come across 1956 Mom relaxing on, say, the floor of the Post Office or while waiting in line at the bank. 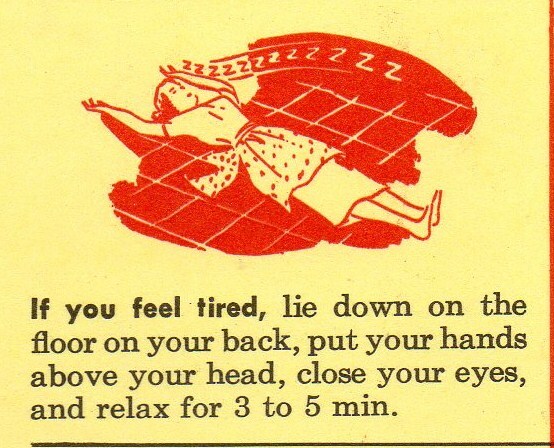 But a wise 1956 Mom would have kept this handy little tip bookmarked should she ever need to explain to dinner guests why they found her lying down on the kitchen floor after sampling, god forbid, one too many Brandy Alexanders. 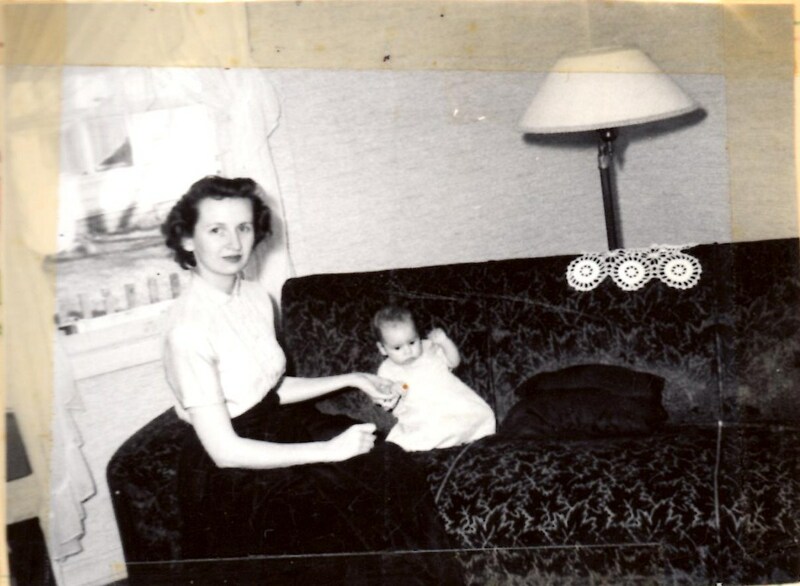 1956 Mom gets all her thoughts from Betty Crocker! 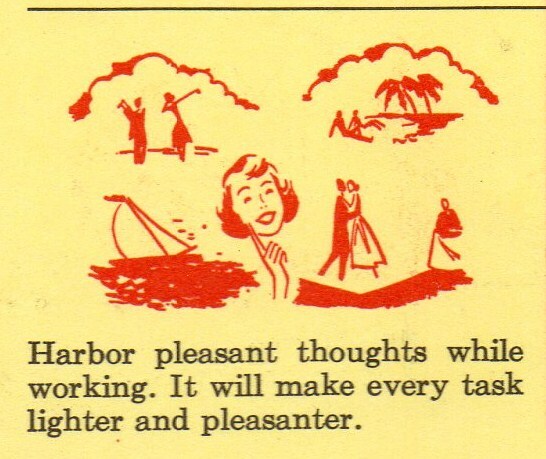 Not only does Betty Crocker want 1956 Mom to harbor pleasant thoughts while scrubbing the kitchen floor so clean she’ll be able to lie down on it for 3 to 5 minutes, she is even giving 1956 Mom some suggestions about what these thoughts might be. Such as relaxing on a tropical island for instance. Or dancing one-legged with a guy whose center of gravity is somewhere around his knees. Or maybe 1956 Mom could distract herself from her work by thinking about a sailboat with a dangerous starboard list that perhaps the guy with the low center of gravity just happens to be sailing on. But chances are what 1956 Mom thought was the pleasantest of all these suggestions was thinking about her husband holding her golf bag waist-high for her while she leisurely takes thousands and thousands and thousands of practice swings. 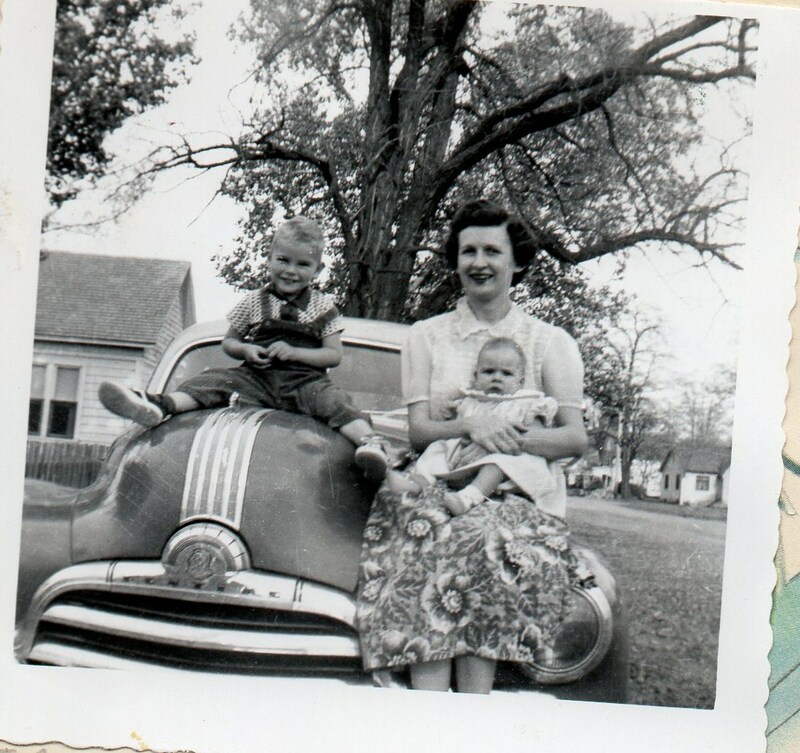 If only 1956 Mom could find a kitten in a tree . . . it would be hilarious! This tip is a little more tricky, however. Betty Crocker is only suggesting 1956 Mom find a kitten in a tree so that 1956 Mom will have something — anything to talk about — besides relaxing on the kitchen floor and thinking about cookbook-suggested topics. This is just a suggestion because searching for a kitten could be dangerous to 1956 Mom’s health. Obviously, it took 1956 Mom hours and hours of uninterrupted hiking to happen upon a kitten in a tree. Which means by the time 1956 Mom found the kitten in the tree, she was horribly emaciated and her waist had dwindled from its normal circumference of 7 inches to a measly 5 and 3/4 inches. 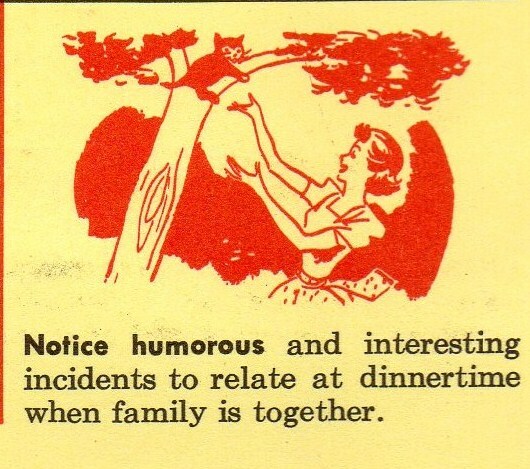 Of course, maybe it was well worth it because, in the end, 1956 Mom did have a wonderful story in her brain about finding a kitten in a tree to tell to her family at dinnertime and — when the time was right — she managed to tell her story with good humor and aplomb. It was a story that her family would have found uproariously funny too had they not already left the room. Hey look what I got for only 23 cents! 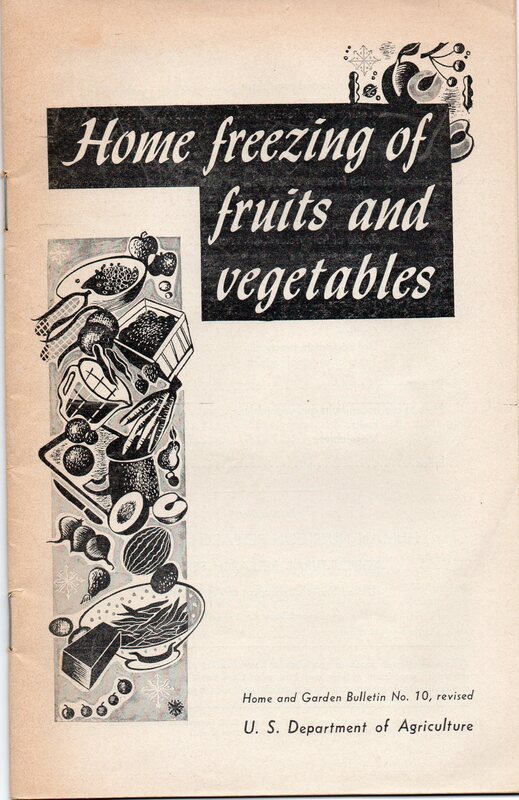 Now I know you’re thinking how hard up for fun does a person have to be to go to a thrift store and come home with: Home Freezing of fruits and vegetables (bulletin 10) by the U.S. Department of Agriculture circa 1957 and be pleased as punch about it? I am. I did. And I was. 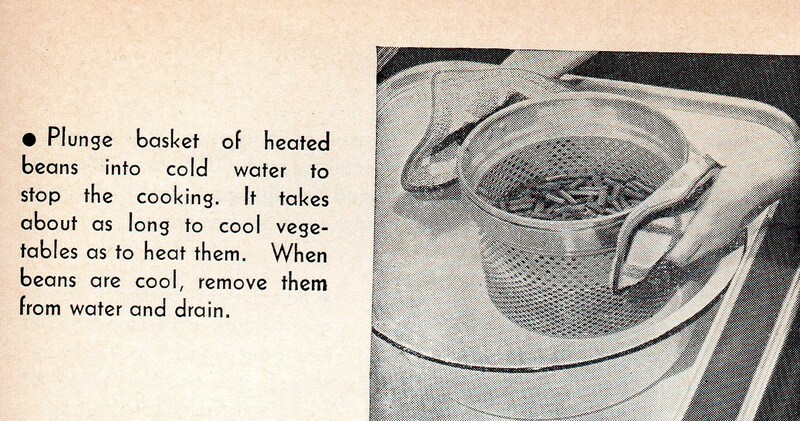 Back in 1957, everybody who was anybody was into freezing food. It was practically a national pastime for heaven sakes! My parents didn’t own a home deep freezer, so they rented a space in the walk-in freezer at Blower’s Grocery Store. I think I was about six years old, and I remember my mother giving us a lecture each week as she stood outside the Blowers big freezer door. “Can we come in too Mommy?” we always pleaded. Here's Mom making sure my limbs haven't frozen solid. Then my mother would assume her head-up, shoulders-back, pioneering-woman stance, open the door to Blowers walk-in freezer and march in like a brave soldier who didn’t hold out much hope of returning alive. After a few seconds, she’d reappear with a several cuts of meat wrapped in white butcher paper and was always bitterly disappointed at what cuts of meat she managed to grab without getting frostbitten (or something unimaginably worse). Anyway getting back to my fabulous 23 cent find. 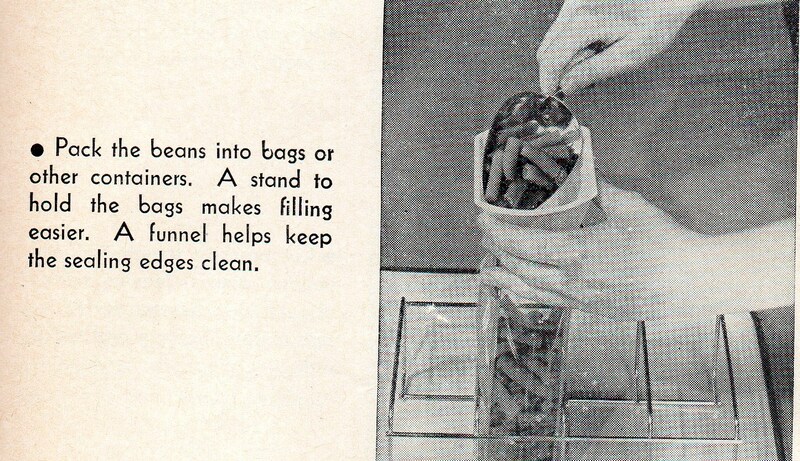 I know that life was more structured in the 50’s, but these GOVERNMENT ISSUED INSTRUCTIONS for freezing string beans make you want to get into a time machine and put a flaming bag of poo on Mamie Eisenhower’s front porch. Ok, they are giving you some leeway here. 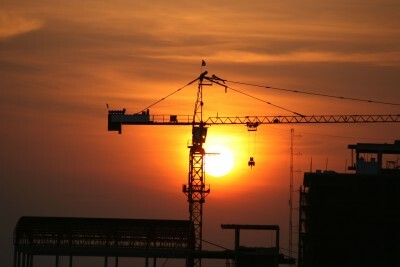 1- or 2-inch pieces. But . . . you must line them up EVENLY first. And then sliiiiide them all over with the knife to the others — making sure they are Even Steven at all times. AT ALL TIMES!! You cook the beans and then you PLUNGE them into cold water to stop the cooking. Don’t ever ever ever just SET them in cold water, they will just keep cooking and cooking and cooking like they’ve been exposed to a radioactive isotope (which, in the 50’s, wasn’t as rare as you might imagine) and we know what happens when that happens. Radioactive 1- or 2-inch pieces of KILLER STRING BEANS! This is important now so pay attention. Don’t even try this unless you have a GOVERNMENT ISSUED String Bean Bag Stand and a Green Bean Funnel. How else would you put them in the bags for freezing in a home freezer? Surely not with your bare hands? Frankly, the U.S. Department of Agriculture is practically sick to its stomach that it would even have to mention this. Ok, do you see this? You must have your string (not to be confused with string beans) precut into what looks like approximately 2- or 2 and 2/16th’s inches of string placed no more than ¾’s of an inch from the outside of your little finger. Head space is also quite important. Because apparently in the 50’s string beans had heads for which one must alott space . . . and if those bags get brittle? Uh Oh. It’s not going to be pretty. President Eisenhower might have to send over Mamie to pay you a little visit. And you don’t even want to know why they called her Mamie. First of all, let me thank El Guapo at Guapola for coming up with the excellent idea for the title of this post. 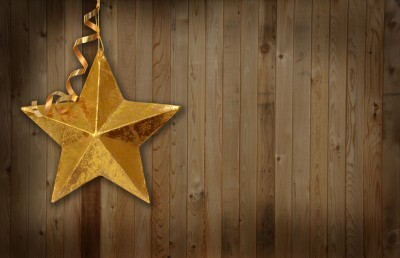 BTW, I am planning to write my Versatile Blog Award acceptance post next week once the Eggnog runs dry. And I would like to officially thank my blogging buddies, Guapola, Running Naked with Scissors and The Mainland all of whom were kind enough to nominate this blog for the Versatile Blogger Award and whose blogs I enjoy so much I have to wait until AFTER I drink my coffee before I read them so as not to coffee spray all over my desk. Oh Happy Day! Joy of Joys! A new Pottery Barn Catalog! Let’s flip through some pages together, shall we? Hey! Lookie! This Pottery Barn Sectional is made entirely out of Sustainable Seagrass! So apparently there’s a big ol’ lawn on the bottom of the ocean that Pottery Barn mows to get seagrass clippings so they can make couches out of it. Who knew? Of course, PB is sure to tell us that the seagrass is SUSTAINABLE. In fact, upon closer inspection, the only adjective used in this month’s Pottery Barn catalog seems to be the word “sustainable”. I have no idea why this is — but I’m happy to make something up. Once upon a time last week, a careless Pottery Barn catalog-writer temp forgot to lock the safe where Pottery Barn keeps all its “power-selling adjectives” And somebody stole them all! Except for the word “SUSTAINABLE” which, luckily, the Pottery Barn Catalog Editor takes home with him each night to safely stow under his pillow for safekeeping because “SUSTAINABLE” is their single, most-important, show-me-the-money adjective EVER! 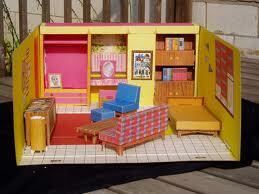 And if somebody were to steal that one, Pottery Barn would go bust in nothing flat! In fact, PB would probably not argue with the assertion that the only difference between them and The Dollar Store is PB’s genius for inserting their prize adjective “sustainable” 17 times on every single page. Anyway, getting back to the sustainable seagrass that PB likes to make couches out of. This might be a good time to point out that keeping the lawn on the bottom of the sea sustainable is no small feat. In fact, it’s a waterloggingly, back-breakingly, eyeburningly difficult task if ever there was one. Pottery Barn goes down deep to get to the bottom to stay on top! To keep the seagrass growing nicely, Pottery Barn Scuba Divers have to dive way down deep to lay an underground sprinkling system on the ocean floor lawn and then swim clear back up to the surface to turn the faucet on and then swim clear back down to the bottom again to make sure all the zones are being watered properly. Next thing you know, Pottery Barn has divers dropping left and right from the bends, and they have yet to even fire up the underwater lawnmower! Just thinking about it makes Pottery Barn tired, crabby and somewhat explosive. The bottom line is there is absolutely nothing Pottery Barn won’t do to bring you beautiful decorating people! NOTHING! And please be of good cheer, everyone, for we still have 166 more pages of our beloved Pottery Barn Catalog to peruse together . . . and if that doesn’t bring you in off the ledge, I don’t know what will. “What makes some of us smarter than others? Or put another way, why am I smarter than you?” Barbara Buh, Co-founder of the Applied Large Brain Institute and Science Sincerely Yours Foundation Advisor took me by surprise with this question while we were setting up our display table at the Compass, Watch and Eggtimer Scientific Summit in Uppenappen Switzerland. I momentarily stopped lining up the eggtimers so that I could give her question some focused thought. Before I had a chance to answer, Barbara Buh, also Professor of Neuropsuedoscience and Director of Big Brain Institute at Mensa Medical Center in Nome Alaska pulled her rhesus monkey, Pieces, from beneath her top hat and began asking it rapid-fire questions to prove her point. Pieces just sat there looking glum. After four minutes and 13 seconds of silence, I suddenly realized that Dr. Buh, also Chief Board Adviser for Test-tube Science and Welding Technology at the Goggles Institute in Anchorage Alaska was directing these questions towards me and not her Rhesus, Pieces. I tried to nonchalantly keep winding watches but I could feel her piercing gaze penetrating me like tiny daggers or, failing that, very large needles. “Am I allowed to google?” I finally asked and was instantly angry at myself for detecting a quiver of fear in my voice. “If you must.” Dr. Buh, who was also Senior Research Analyst at the University for Internet Surfing for the Ketchasketchcan Scientific Center in Alaska, replied. But Dr. Buh didn’t respond. She was too busy performing the Heimlich Maneuver on Pieces who had managed to choke on one of the egg timers while I was googling. Which seemed like as good a time as any to break for lunch. Gosh I wish I was a Foodie! If I’m going to carry around extra weight with me everywhere I go, I wish I could at least really enjoy the food I’m eating too much of. 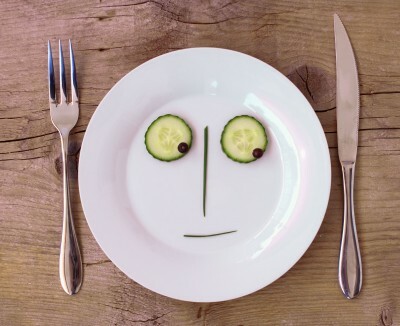 At no time in the history of the human race have so many wonderful food choices been so readily available. Yet, do I bother to partake of the exciting noshing to be had from our modern-day food flotilla of stupendousness? Not really. I usually just slap some Country Crock on a bagel call it lunch. 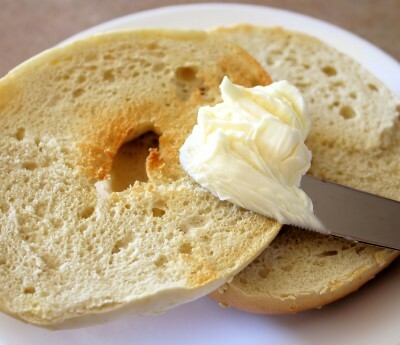 My food choices are as marginal as they are margarine. But why eat this boring choice when I could easily gather together every item it would take to make, say, Holiday Chutney —which I came across seconds ago by googling the Food Network website and picking “Holiday Chutney” at random. So here’s Cathy from the Food Network under whose tutelage I could explore the excitement of cooking a Foodie-type dish such as “Holiday Chutney”. After all, Cathy, who has a pretty good job, seems hell-bent on it. "I'm going to figure out a way to eat this thing if it's the last thing I do." First Cathy tells us to bake this teeny decorative pumpkin and then remove all the seeds from it — which is what Cathy says she likes . . . no make that LOVES doing. 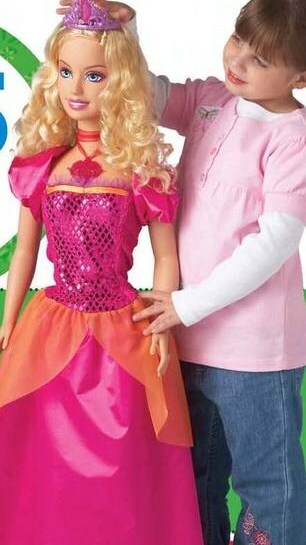 Well, see that’s the difference between me and Cathy. Cathy enjoys this type of activity which means she’s living her life to the fullest. Cathy is living in the “now”. As you can see, Cathy is living in a more fun "now" than the "now" I'm living in. 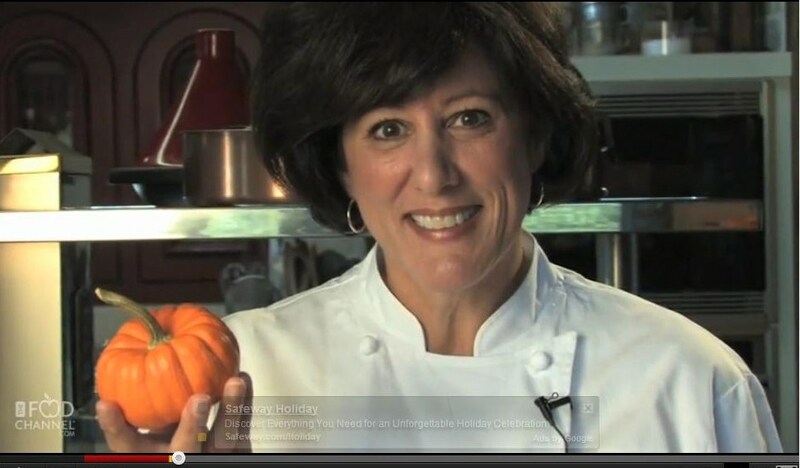 And I admire Cathy’s ability to derive so much joy from something like de-seeding a miniature decorative pumpkin. I really do. As for myself . . . well I suppose if I were to suddenly develop an overwhelming craving for minature decorative pumpkins — due to a serious deficiency in Vitamin A (probably as a result of eating nothing but bagels and margarine) AND if I was stranded at, say, at the North Pole and the only thing I could scrounge up was a dusty miniature decorative pumpkin left over from Santa’s rockin’ Halloween party, I’m sure I would put as much umph into de-seeding the darn thing as Cathy does, ok? 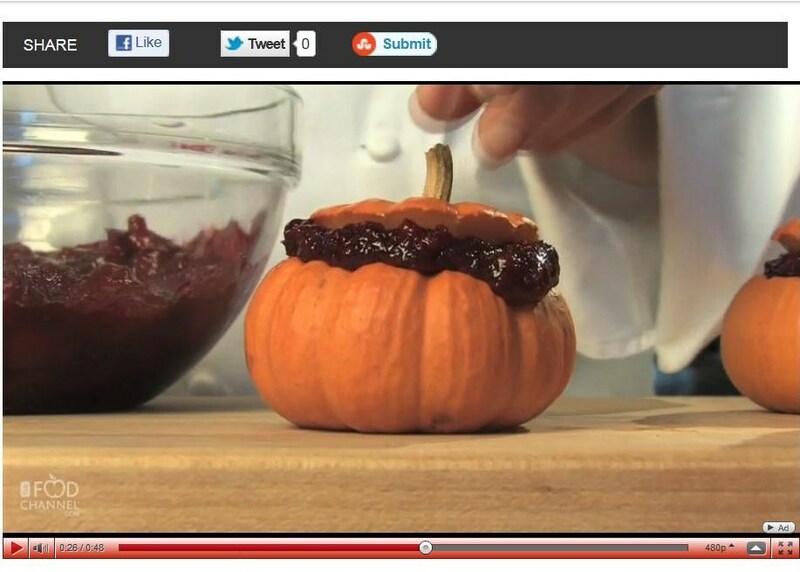 Holiday decor stuffed with chutney never looked so edible! So my hat’s off to you, Cathy. There’s a talent in making Halloween Decor look edible which is something you obviously have in spades! I just wish I could have seen the look on your face when you picked it up and took a great big ol’ scrumptious bite out of it. What’s that? You didn’t eat any? Well, probably because you’re not hungry, that’s all. I’ll bet you anything Cathy will take it home with her tonight and maybe later on try feeding it to her little pet guinea pig, Charlie, or failing that, try feeding it to her little husband, also Charlie (just coincidentally). Whoa Charlie! Save some room for Holiday Chutney!" So maybe I’ll give this Foodie thing a try. I was going to have a bagel with margarine on it for supper, but now Cathy has me inspired. I’m looking around this very minute trying to find something to stuff with chutney. And even though I don’t have any chutney, per se, I’m pretty sure I can figure out a substitute. Well, let’s see . . . I could grab a ball off the Christmas tree, it’s hollow . . . . . . I’ve got some cheddar cheese . 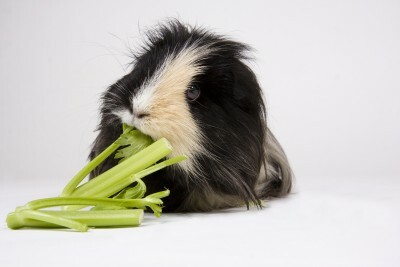 . . maybe I could get the guinea pig involved somehow . . . if you need me I’ll be in the kitchen . . .